While Dalicious is still taking sign-ups, Taeyang Quarterly has entered its first challenges of 2009. What started out as 51 contestants soon translated into 42 entries, with judges passing only 35 on to the next challenge. Of those, 32 entries were received, with the judges passing 25 on to the third challenge. Anyone participating in the upcoming Dalicious should pay close attention to the ideas and compositions used in Taeyang Quarterly, and to those who continually advance to the next challenge. This is the first of a series of commentary posts on the photographs of Taeyang Quarterly. It was intended to be one post per challenge, but due to the amount of time put into the forum transfer, I’ve compiled the first two articles into one. You can add your own thoughts, as well! Notice: All photographs appearing on this page are used with permission. The first Taeyang Quarterly challenge required the inclusion of text within the photograph. The submitted entries quickly split the entrants into two groups. On one side were photographs where the required text failed to play a role in the scene. Consider TaeYang sleeping on a couch, a few books on the coffee table beside him. 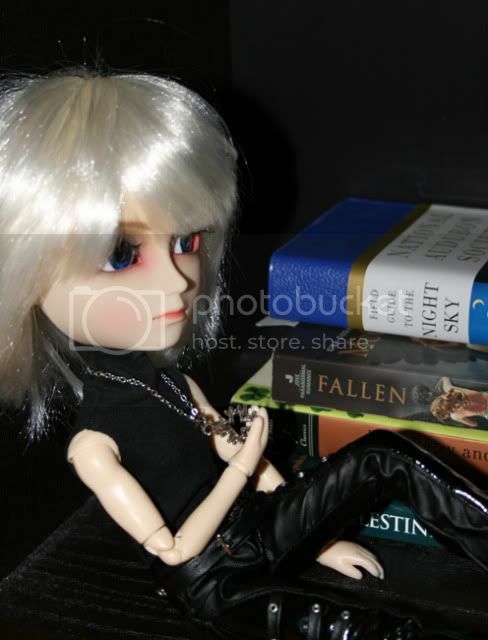 There is no relation between TaeYang and the books. The other side of the photographs put the text actively into the scene. Set one of those books open and face down on the sleeping TaeYang’s chest, and suddenly it tells a story. The title on the cover of the book has just shifted from an inactive background element to an active part of the scene. Graffiti appeared in a few photos. 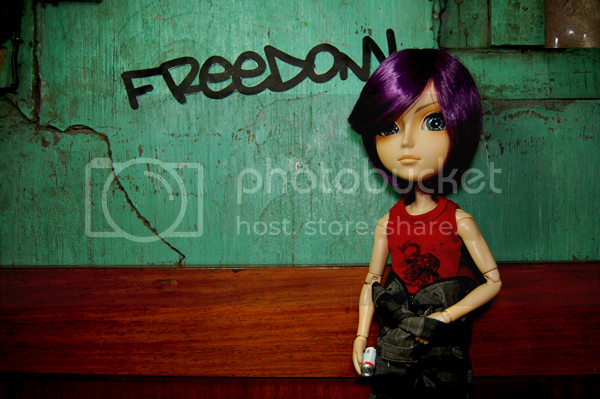 nightfallsdolls‘s Kei finds himself standing before a graffiti-covered building, a skateboard under his arm, and graffiti on the building in the background. As a photograph, the composition is sound and everything works together. The only thing lacking is an active connection between Kei and the graffiti. In contrast, magnetic_rose has given Hime a can of spray paint. The “freedom” sprayed onto the grimy wall isn’t a message Hime happened to walk by. It’s his own message, something he chose to leave behind for others to see. The same is true for phantomwings86’s Ryder, very much caught in the act of vandalizing the wall. Books made for an even more common theme in this challenge. The same distinction is clear here. On the inactive end, ravenwcatz has Michael posed before a background of unrelated books. Had all the books been related by subject, and had Michael been doing something clearly related to that subject, a strong connection would have been created between Michael and the books. Opposite this is the active storytelling scene, where yuhime‘s Allen is reading “Charlotte’s Web” to little Taro. Beyond those two themes, there was a lot of variety. Many told a story with the included text, and these are the photographs that shine. 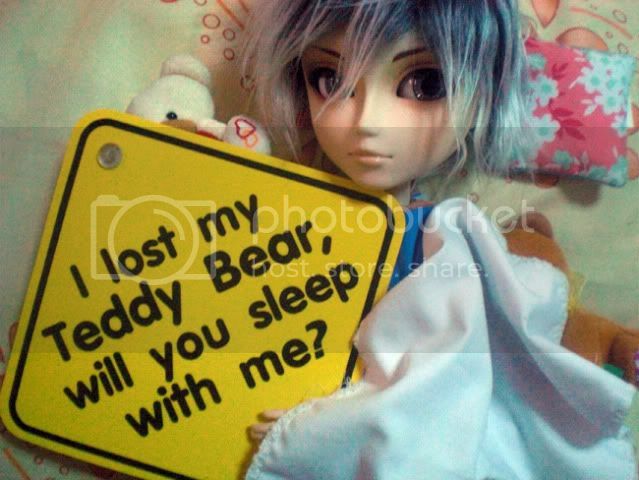 fancylala143 could have given Kagami his “I lost my Teddy Bear” sign and stopped there, but adding a couple of teddy bears hidden behind the sign and under the blanket reveal a ploy on his part, pulling the story together. The subject matter of yukittie‘s entry may be outside my personal comfort zone, but it gets points for uniqueness. 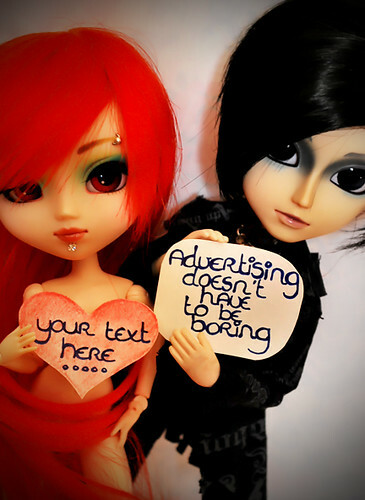 The text presenting advertising space is an active part of the photograph. It’s such a strong element that the photograph would not be the same without it. The crop is a little tight (zooming out just a bit would have kept the eyes in full view), but the angles make for a strong composition that leads ones eyes across the photograph. yukittie has done an excellent job of placing the elements in this scene. 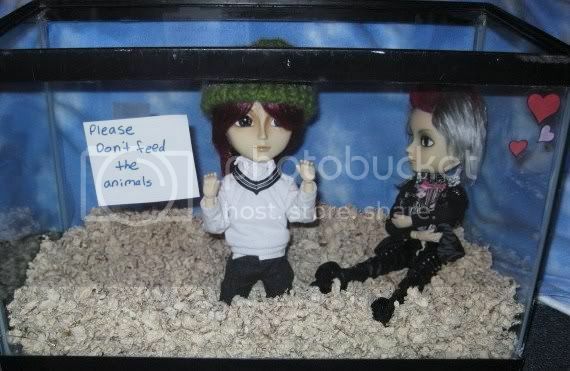 aurons_girl‘s entry shows a unique creativity, putting Bruce and Naota inside a glass pet tank. The text here creates one story, whereas changing the text, or removing it altogether, would have made for a different story. 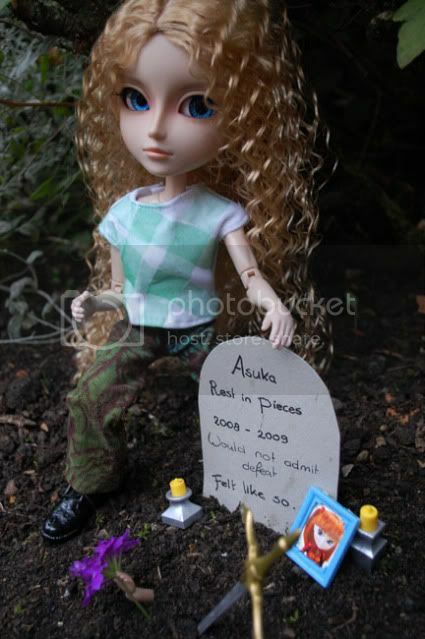 Humor and originality fill cruella_just_me‘s photograph, as Dorian stands over Asuka’s grave. Basing the gravemarker’s text on Asuka’s “feel like so” text works very much to an advantage here. The text being flush left gives a 3D feel, as if looking at the front and side of the stone. The small photo of Asuka is a nice touch, although the hand sticking out from the grave is rather disturbing… Looking at the composition, this photograph has a good angle, and the photo is filled completely, without any unecessary open space. This is a good example of how to fill the frame of a photograph. I find ccbychlaz‘s entry to be a good idea, as Yuujirou’s actions confirm the posted notice. This is also a good example where cropping is important. Here, the crop is right, with Yuujirou’s book bag just barely cropped at the corner, and some odd cropping on the bulletin board. Zooming out would have rendered the text even more difficult to read, so for this kind of photograph, I would recommend zooming in just enough to hide the top and left sides of the bulletin board’s trim. Cropping closer to Yuujirou’s arm will remove more of the book bag, but showing either a full book bag or half a book bag is better than cutting off just a corner. This had to be a difficult one to compose well, and ccbychlaz did a very good job for a first challenge photo. 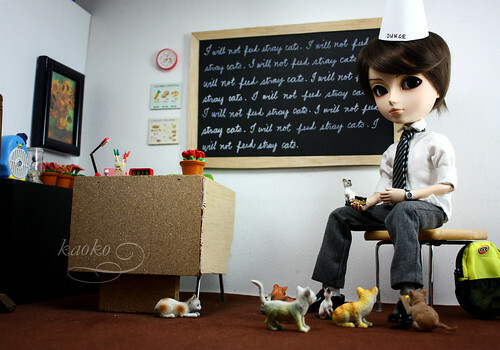 kaoko_cow‘s entry can be summed up in one word: Kitties! This entry shows time and effort in getting the scene just right. The props frame this photo very well, up to the clock on the wall, and down to Wills’s backpack on the ground beside him. The cat attacking Wills’s shoe simply adds a smile. In the beginning, there was Adam, and then there was Eve. 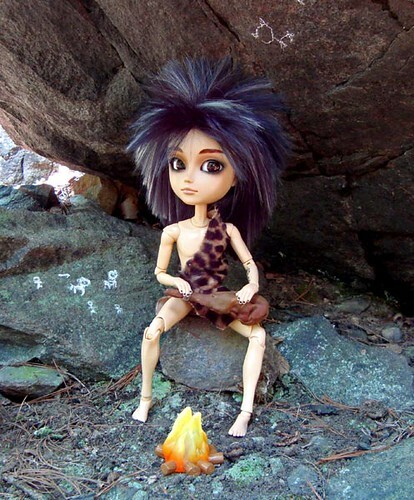 After an unfortunate episode with a snake and an apple, mankind moved forward to a more sophisticated time: the stone age. Hop over ancient Egypt while skipping through old Rome and jump into a knight’s armor in medieval England to see where we’ve been. Traveling in and out of Japan, taking in the sophistication of Victorian England, skirting across the Highlands of Scotland, riding into the Old West sunset, Chaplining across the theater screen, and coloring his way through the 1970s, TaeYang has been everywhere in every time. This is the second round of Taeyang Quarterly, Design of a Decade, where a period in time must be represented. At the end of this stage, those contestants who still have a lot to learn about photography and composition have fallen out of the competition. There are enough quality submissions whose concept, originality, and execution are starting to create competition for the rest. This was the last of the “easy” challenges. This time around, there was very little duplicated representation in the challenge’s entries. Even though prehistory had two entries and Edo Japan had three, there was no duplicate representation of ideas. It is interesting to see where Heian Japan’s two involved fictional character Hikaru Genji, and the silent film styles of Charlie Chaplin both took from the same Chaplin film. The last few decades manage to show representation without repetition of ideas. This was a good turnout for the Taeyang Quarterly competition. The most limiting aspect to this challenge is ones selection of outfits. My own experience in this challenge went along the lines of, “I have Scottish outfits, so I’d best find a specific period in time to relate them to.” Going in a different direction, nuwandalice thought outside the box and wrapped Pip to create a mummy of Ancient Egypt. 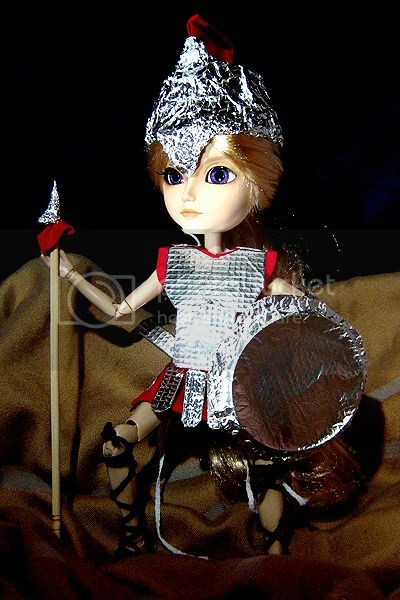 In similar fashion, heartdaisy presents Edward clad in an armor of foil. Rather than working out anything elaborate, yukittie opted to throw clothing out the window, embracing an Adam and Eve theme. The winner for most elaborate set-up this challenge should go to ochiva, whose collection of Japanese-style outfits and props put Raven into the role of fictional Hikaru Genji of Japan’s Heian period. A detailed scene, a well thought-out pose, and a composition that knows exactly what to keep in and what to cut out suggests Ochiva is one to watch in the following challenges. It’s hard to pass up mention of moeeeh‘s entry. 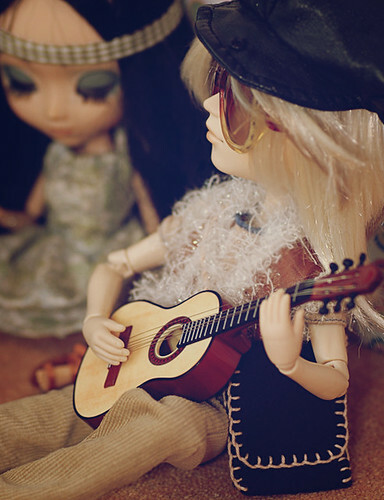 Luka and Annisette go all out to represent the hippie age of the US. With a tight crop, a decent depth-of-field, and just the right amount of low saturation, Moeeeh has succeeding in framing the scene well to portray the spirit of the 1970s without any unnecessary elements to detract from the scene. Maintaining this level of attention to Luka’s part in the photograph, of the theme, and of the composition and technical camera settings should keep Moeeeh in the competition for a number of challenges. Going back in time to prehistory, it seems Bill’s hair fits the part of the everyday caveman. requiemart made good use of location, and the cave drawings are a strong plus to pull the image together as a whole. The only thing missing is the ever-constant 5 o’clock shadow seen on most of the male characters in Hanna-Barbera’s animated series, The Flintstones, but we won’t hold that against Bill. 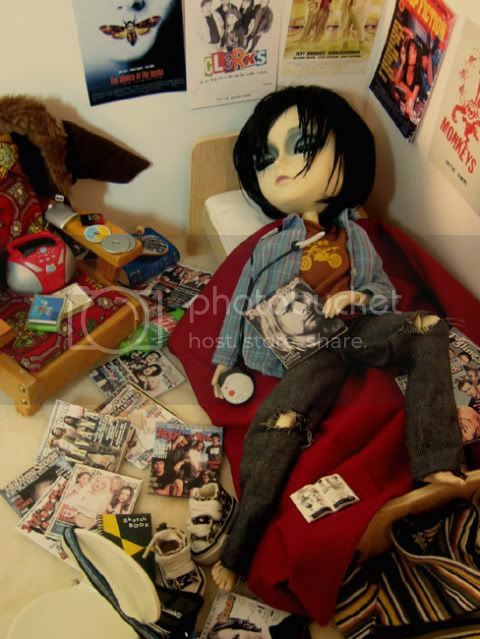 If there was ever a photograph showing the youth of the 90s, it would be daydream_may entry, as Holden lazily sleeps among magazine after magazine. The CD player, the shoes on the ground, the holes in the knees of Holden’s jeans, the posters on the walls, the Mountain Dew lying around—Generation X has never been portrayed so succinctly. The pose is perfect. The angle is right. There is nothing lacking in this composition. As with ochiva and Raven’s entry, daydream_may and Holden have established themselves as strong competition. I admit I don’t understand the concept of Gilraen Aclamense’s first challenge entry, but the cancan-themed entry for the second challenge is a brilliant entry. It’s instantly recognizable, and very original. Every detail of the scene work in this entry’s favor. The red of the dancer’s dress draws attention to her, and the focus and crop steers the viewer’s eyes down across her leg. Crossing over a well-selected background, ones eyes land upon Dorian, and his drink completes the setting. The darkness and noise in the photograph appropriately set the atmosphere for the time and place. Before seeing this challenge’s entries, I had never heard of Charlie Chaplin. 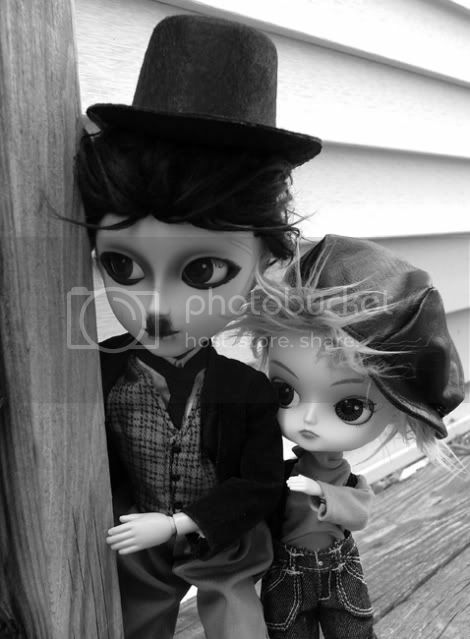 He was king of the era of the silent film, and Chaplin with Jackie Coogan in the 1921 release, “The Kid”, inspired both CornflowerBlue’s entry and kaoko_cow‘s entry. 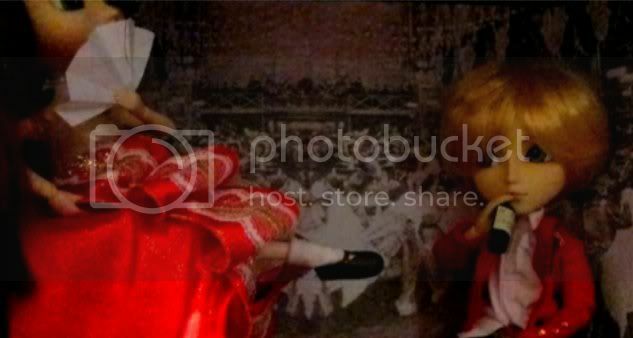 Both Edward and his compansion and Wills and little Suzume do well to recreate scenes from an era long past. Tell a story! 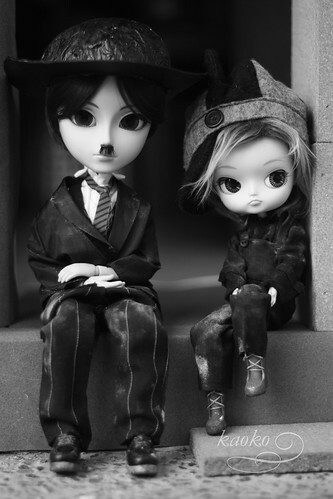 The doll should have a part in the story. Any props must be relevant to the story. The background acts as the setting for the story. Work on those poses! An unnatural post will result in a photograph that looks “wrong” somehow. Not sure if the pose is realistic? Try putting yourself into that pose and see how it feels. Try different angles! Take a photo from straight on. Take a photo from higher up. From lower down. From each side. Tilt the camera sideways just a little. Step back. Zoom in. The more photos you take of a scene, the more material you have to find just the right entry. Look at the photos that did and did not make it through each challenge of Taeyang Quaterly, and see how this advice applies. Use this information to your advantage, and advance to the next challenge.